I recently had two conversations with Firefox users who did not know that Firefox came with the means to zoom in and out of a website. They were using external applications to magnify parts of the screen and where surprised that they could achieve the same effect natively in the browser as well. All of the zooming options are available from the View menu in Firefox. Firefox users find options to zoom in, zoom out and restore the default level in the Zoom submenu there. Note: The menu bar is not displayed anymore by default in newer versions of Firefox. You can tap on the Alt-key on your keyboard to bring it up, so that you can access the View menu and its zooming options. The keyboard shortcuts come in really handy if you stumble upon badly designed websites or those that use images or other elements that are barely decipherable in default view. The only thing that one should realize is that the zoom level works on a domain basis. Multiple pages of the same domain that are opened in different tabs will all be effected by the zoom. You can also add zoom control buttons to Firefox's interface. The easiest option to do so is to press Alt to bring up the main toolbar, and select View > Toolbars > Customize from it. You need to locate the Zoom Controls button which you can drag and drop to a Firefox toolbar so that it becomes available there permanently. Update: Firefox users can also install the Firefox Mouse Zoom extension which adds page zooming options for the mouse. It furthermore allows users to change the default zoom levels, for instance to make them more granular or increase the maximum zoom level available. The maximum zoom level is 300%, the minimum 30% which should be enough for all websites. A right-click on the page and the use of the mouse wheel zooms in or out of the active page. I thought most people knew about this handy trick. It’s also applicable to a host of window based applications too. Most applications that have a chat of some kind can have the text up-sized by using ctrl + scroll wheel up. You sir, are a pervert. You wouldn’t believe how many people doesn’t know about ctrl+c ctrl+v! Yeah I’m with “Satanicat” – thought everyone knew about this. On the same topic – Does anyone know why when I open Yahoo Mail using FireFox my screen zooms in-and-out, and finally settles on the zoomed in mode. it’s easily correctible by clicking “Ctrl-0” but the zooming is annoying. I can zoom via my Cirque touchpad mouse which simulates a mouse wheel. But d zooming work adequately on an LCD monitor? I keep my 20″ CRT (running 1660 x 1200 resolution) because I thought that LCD monitors didn’t work well if you changed text from the native size. I’m not an expert on the topic but does not the screen resolution stay the same all the time even when zooming? A great FF extension for page zooming is Default FullZoom Level. It stores the zoom level for each website. Today I stumbled upon something interesting. I changed the zoom level of a website, closed Firefox, restarted the web browser afterwards and loaded the page again. The zoom level was still on the changed level. Can it be that firefox stores Zoom levels now? Yep, know all about Ctrl-C, Ctrl-X & Ctrl-V, but I have never come across this one before. Just goes to show we never stop finding new things to learn. I have to admit I never knew about this one, should definitely come in handy. Thanks heaps. I use this feature a lot, but there is one minor problem. Some pages that were set to a certain zoom level reset themselves to the default zoom level every time I visit them. One such site is news.yahoo.com. Another is tvguide.com. Is there any way I can stop these web sites from reseting my chosen zoom level? I use this function often.. but I’m trying to figure out if the zoom supports images like what IE does. When you zoom, they only manage texts, but not images / flash / others. Anybody know if its possible? Found an add-on that does that. Thanks anyway! As much as I like this feature, do not show it to people who are not very tech savy. I showed it to my copy editor and he showed it the main editor and now I have to periodically fix their browsers because the site is all bent out of shape. It is amazing how a person can increase a site’s size say 20 times, then decrease the font size 23 times, then go into the options to change the default font size, then wonder why the website looks weird and somehow the blame usually falls on the web designer. Plus the reset button doesn’t go back to the websites default unless you are very conservative with the way you increase and decrease sizes. To be honest I really hate this feature. why don’t they have zoom button right on the browser, like Safari? that is so much easier…SO MUCH! Should be a button or a mouse funkcion for zooming like in IE . I am tired using keyboard shortcuts. I’m new to this and still somewhat confused … and my eyes are old too. I’ve been using IE and down in the lower right is an option to set pages at 100% or 125%, etc., and this ‘zoom’ level remains the same for any / all web pages, and needs not be re-set each time I open. I like Firefox quite well so far, but needing to set zoom size each time isn’t helpful. Ideas? Is there another tool / add-on that I am missing? You can try this add on: https://addons.mozilla.org/en-US/firefox/addon/2592 , that’s called NoSquint, it helps you set a “default” zoom setting for Firefox too! Most browsers have “view” or “zoom” option when you click on the the taskbar. Where are the the forward an back buttons? Do I need a stupid manual to use this browser? why not put view or zoom in the taskbar right click? 3. The zoom mode is restored every domain name or tab as well as the zoom level. 4. 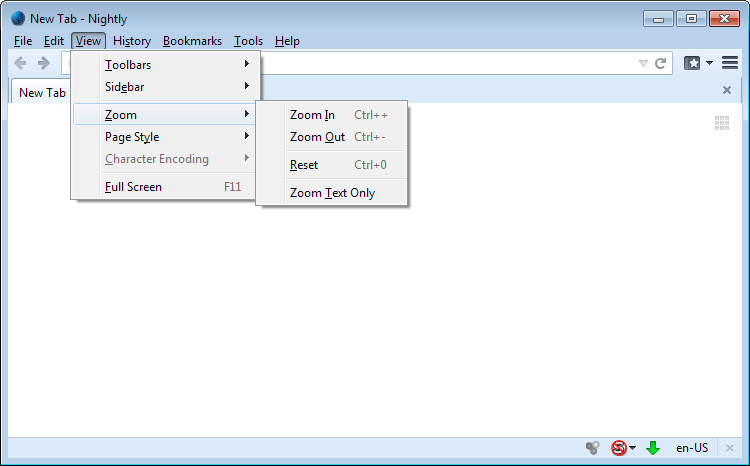 In the case of a local file, you can set whether zoom every file or every folder. 5. Two toolbar buttons are provided. 6.Indicate Zoom level in Statusbar. Where, An accel key may be a crtl key in Windows’s keyboard. Back to IE for me! 6.000 add-ons and it simply could not import my ie bookmarks?. No forward or back buttton. Somebody needs to go back to school! Learning Excel was way easier! thanks for the commands list! THANK U FOR THE ZOOME! …But what can I disable the zooming in a web page by html code? Thanks so much. A simple and straight forward answer. What all of this leaves off is that Zoom should be obvious and should not require one to do an online search to figure out how to do it.